Posted at 12:06 pm on September 21, 2012 by Lori Z.
Democrat apologitis continues! Senator Kerry and the U.S. embassy in Islamabad, Pakistan, continue to not get the White House’s new memo. Days after the murders at our consulate in Libya, the White House finally admitted that it was a terrorist attack, after blaming a crummy video that no one saw and condemning free speech. For a week. Yesterday, the U.S. embassy in Islamabad continued the State Department’s pattern of apologizing for ouchy feelings. Free speech is so meany pants! And today, they did it again. Right before yet another round of violence in Pakistan . What brought the apologitis on this time? Why, Senator John Kerry, natch. 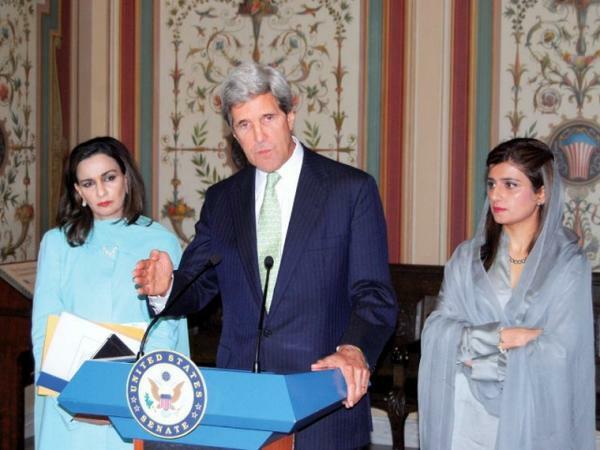 Senator John Kerry met in Washington yesterday with Pakistani Foreign Minister Hina Rabbani Khar and Ambassador Sherry Rehman. Senator Kerry met with them yesterday in Washington, where he condemned free speech. #Pakistan-US: As we kick off the FM's first official visit to Washington, we look for dialogue to be focused, substantive and constructive. By substantive and constructive, she clearly means apologetic and craven. Senator Kerry made these remarks to the media after an hour-long meeting with Foreign Minister Hina Rabbani Khar and Ambassador Sherry Rehman at Capitol Hill. Senator Lugar, Senator Bob Casey, and other members of the Senate Foreign Relations Committee also attended the meeting. “All of us in the US, all of us condemn this senseless intolerance exhibited by the video which very few Americans saw and have seen. We feel it is without any legitimacy, any potential redeeming quality. It is an insult to everybody,” said Senator Kerry. He added that no religion deserves disrespect, and the US was founded on the principles of tolerance, that everyone needs to work towards. Right. Tolerance for thee, but not for me. “Senseless intolerance” … which no one saw. By saying the video has no redeeming quality and no legitimacy, he’s saying that free speech itself is not legitimacy enough. Free speech itself is a redeeming quality, Senator, and one upon which this great nation was founded. What is truly an insult to everyone, including the men and women who have died protecting our freedom, is your gross disregard for The Constitution. You seek to quash free speech, based on perceived insults to certain protected quarters, by condemning the free exercise thereof. Free speech is redeeming, sir. The quashing of it is sickening. @usembislamabad Where's the official tweet about the first amendment rights for the maker of that film…regardless of its content? Pakistan’s foreign minister almost topped him with this statement. In her remarks, Foreign Minister Khar thanked Senator Kerry for his statements on intolerance. “Islam is a religion of peace, Prophet Muhammad (PBUH) was a messenger of peace,” said the minister. This must end. The craven and disgraceful condemnation of free speech in order to appease people who wish to kill us has moved beyond just annoying. It’s deadly. A policy of appeasement does not keep us safer; it puts us at greater risk. This is not America. November cannot come soon enough.